Do You Want Lump, Backfin, or Claw for Your Recipe? If you are planning to cook crab, you can get it in two forms—whole or picked meat. If you get it picked, that means that the hard work has been done for you. You can spend less time cracking, picking through, and scrounging for the tasty morsels of crab flesh, and instead, buy it freshly handpicked for you for $25 to $50 per pound, depending on the grade you want. While there are many subcategories and fine distinctions when it comes to picked crabmeat, it can be categorized into five grades or groupings. Knowing the difference may help you save money and can be very important when you planning to make a certain dish calling for a particular grade of crabmeat. Lump crabmeat is the most expensive. Following that by price, in order, is backfin, special, and claw. These grades refer to pasteurized, refrigerated fresh crab, not the small shelf-stable cans of preservative-laden crabmeat that are found in the canned fish aisle. Colossal lump crab (also known as mega jumbo or super jumbo) is the large chunks of meat that connect to the swimmer fins. There are only two of these muscles per crab, which is why it is so expensive (often $40 to $50 or more per pound). Jumbo lump crabmeat chunks are the same two muscles, just from smaller crabs. Both colossal and jumbo are excellent for those times when you want big chunks of crab to lift with your fingers and dip in butter or your sauce of choice. Colossal and jumbo have a fine texture and sweet taste that should be savored on their own, which is why they are not a great choice for crab cakes. The seasonings might overwhelm the delicate flavor and mixing the ingredients would break up the tender chunks. Putting it bluntly, do not get this type of meat for crab cakes. It is too pricey to use such a delicacy in that way. Lump grade crab consists of broken jumbo lumps and large chunks of body meat. It is less expensive than the colossal or jumbo grades, but still has bright color and superb flavor. Lump crabmeat is best for fancy, impression-making dishes where appearance matters, like butter-poached crab or crab Louis, where you want big, fork-friendly chunks. When it comes to fine dining and restaurant-quality crab cakes, lump crabmeat is the grade of choice. The chunks are large and will hold together with minimal binders. Backfin grade is made up of smaller, broken chunks of lump crabmeat mixed in with flakes of white body meat. It is less expensive than lump crabmeat but has good flavor and enough texture to look appealing in dishes where the crabmeat is somewhat visible, such as crab salads, pasta dishes, and conventional crab cakes. Special grade consists of smallish flakes of white crabmeat taken from the body cavity. This type of crabmeat works best for dishes where good color and delicate flavor are more important than visual impact. 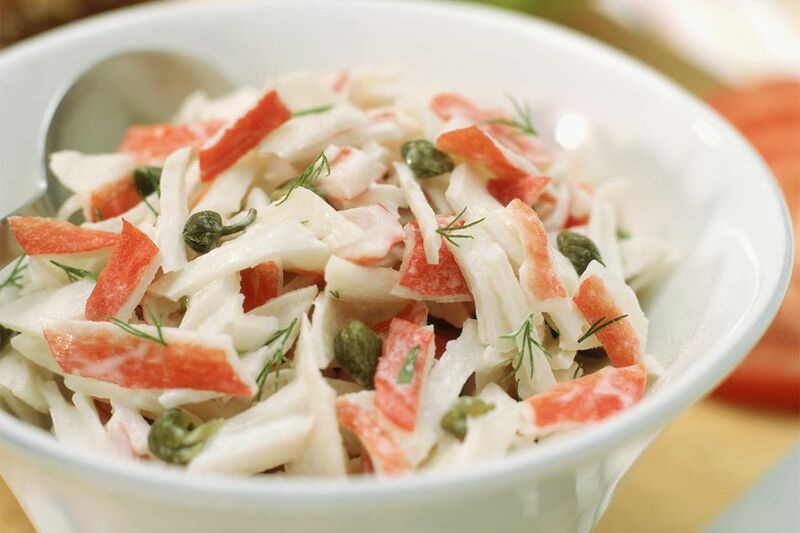 Special-grade crabmeat would be an excellent choice for dips, bisques, omelets, and mayo-based salads. Claw crabmeat is the least expensive but most flavorful grade. Claw meat is pinkish-brown rather than white and has a hearty crab flavor that does not get lost under seasonings. This type of meat is great for soups (such as Manhattan-style crab chowder), crabmeat stuffing, tacos, and stir-fries.